Thousands of people flocked to Scarborough’s South Bay for the traditional New Year’s Day Dip. The Scarborough Lions event attracts around 100 entrants each year and is a highlight of the town’s festive calendar. 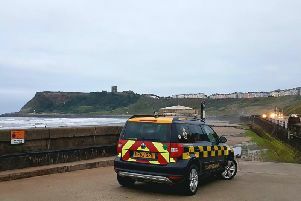 The dip, which took place on the beach near the lifeboat house, opposite Scarborough Rowing Club, is now into its 22nd year. Organiser Alan Deacon said: “Normally we have around 80 to 100 dippers and crowd wise we have two, possibly three thousand. “It has been developing gently over the years. Everyone who wants to take part must fill in a registration form, either in advance or on the day. New town crier David Birdsall took up the role which had been fulfilled by Alan Booth for years and led people in the countdown before dippers plunged into the cold North Sea.